Can I give a gift certificate or gift album? What is the difference between a custom scrapbook and a pre-made scrapbook? What does archival safe, photo safe, acid, and lignin free mean? I have acidic items I want to include in my scrapbook-now what? How do I provide the photos to you? How do I pay you? What payment methods do you accept? How many photos can fit in my project? Can I see progress of my project? Can you use my supplies? Can I hire you even if I am out of the area? What is harmful about my magnetic photo album? Why a custom scrapbook and not a photo album? Who needs a custom scrapbooker? Of course you can! I offer gift certificates, gift albums, and other personalized gifts. If ordering a gift scrapbook and you do not have photos, that is fine, I will leave spaces for the recipient to add photos and journaling when they receive the album. I will gladly ship it direct to the recipient if you would like! What is the difference between a custom scrapbook and pre-made scrapbook? Remembered Moments is committed to preserving today’s memories for tomorrow’s generation and uses all archival and photo safe materials when creating memory albums. Archival safe and photo safe means the items are free from chemicals that speed the deterioration process. This means that all items are free from acid, lignin, and PVC. Materials like newspaper clippings, ticket stubs, greeting cards and other wood-based products are not safe to be near your photos or even in the same page protector. Non-archival materials emit a chemical compound that will speed up the deterioration process. Non-archival materials can still be used but an additional de-acidification process will need to be used. Many non-archival papers have high lignin content (such as newspapers) causing the paper to deteriorate and become yellow over time. Lignin causes acid to re-form in the paper over time. Any type of paper can be lignin free it simply needs to be treated properly in the manufacturing process so the lignin is removed. Many mementos such as newspaper articles, handwritten notes, and other paper goods were not created with acid free materials. The best option is to make a copy of the item onto archival safe paper but if the original is desired there are a couple options, de-acidification spray to neutralize the acid and/or laminating. Journaling is fancy way of saying storytelling. Imagine sitting next to someone looking through your album. What would you tell them about the pictures or the event on these pages? Let's write that down so you don't have to tell the story every time. Journaling can be a description of the photo(s), a story about the photo(s), describe your feelings in relation to the photo(s), or all of the above. I encourage handwritten journaling done by you but I will do computerized journaling for you if desired (you provide the story and I will put it in the album for you). If your photos are prints you can put the related events in an envelope or Ziploc. In each envelope or Ziploc include an information label. These do not have to be filled out completely but I do need to know the basics. Then mail to Edgerton, Minnesota. The time it takes to complete a project depends on the size of the project and is estimated on a case by case basis. This will be discussed at the start of the project and the due date will be defined in the final contract. If you have a specific date the project is needed by let me know and I will do all I can to have a quick turnaround. You will be given updates throughout the whole process whether you are local or many miles away. 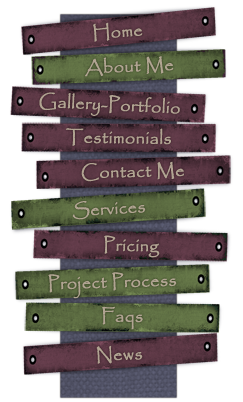 I create a website for each individual client to showcase all of your completed layouts. This is a website for you only and no one else has access to it-unless you give them the link. As I create I will post the layouts on the web for you to see the progress. I will also have ongoing communication via email, phone, or in person to give you updates. If you have left over supplies from previous projects or you thought you would enjoy scrapbooking and have since realized you don’t, or you just don’t have time to scrapbook I would be happy to put them to good use. After I receive the supplies and evaluate the quantity and quality I will deduct a percentage off of the final cost of the album based on the supplies that are used in your album. Supplies that I don't use in your album will be returned to you if desired. The adhesive in magnetic albums contains acid which is known to speed up the deterioration of precious photos and memorabilia. In addition the papers and plastics used may contain other harmful items such as lignin and PVC. A custom scrapbook displays your treasured stories, photos, and memorabilia together beautifully and protects them over time. All items are of archival quality, preserving them for many years to come, unlike many standard photo albums. With a custom scrapbook your stories are right there with the photos so no one will ever wonder ‘where is that?’ ‘when was that?’ or ‘who is that?’. You invested in a wonderful digital camera to capture the memories of your family, now don’t let them fade away on your computer. Invest in your family's memories by showcasing these photos in a custom scrapbook album. Then you are in need of a personal scrapbooker. Many people lack the time, desire, and/or skill to do it themselves; there is nothing wrong with feeling like this. Custom scrapbooking is similar to many other service professions such as a cleaning service, professional organizer, party planner, plumber, or electrician. For example-you may not have the skills to run plumbing so you call a plumber. You may know how to run wire for a new outlet but you don’t have the time to do it so you call an electrician. You may have the skill to produce a party on your own, but may hire a professional to plan a wedding, or other important party that is extra special and you need the additional help. Maybe you just simply don’t like cleaning so you hire a cleaning service. Maybe you are a scrapbooker and can deal with the everyday photos, but maybe you need to hire someone to do your wedding album because it is such an important event. Custom scrapbooking is similar because it takes time, skills, and a desire to provide the client with a professionally completed job. It takes a lot of time and talent to create a custom made scrapbook. The services I provide are all custom services provided just for you to your desires and requests. Not one creation is like another. Each individual has their own stories, photographs, and mementos so each person should have their own individualized scrapbook made just for them. After previewing and receiving your custom scrapbook I am confident that you will be happy you chose to preserve today’s memories for tomorrow’s generation. Yes. The contract assures we are on the same page regarding all the details; such as pricing, timing, and delivery. You can preview a sample of the contract here. All albums are created with care and I will do all I can to make sure you are satisfied. You are involved in the process and able to review scrapbook pages as they are completed, so if you noticed the project is not headed in the direction you imagine, we can make adjustments along the way. While a monetary refund is not possible with custom creations I will do everything possible to make sure you are satisfied with the final product.